Lately my focus on the basics has me working on transitions. Salut has lost muscle mass and so I find its a great way to help condition him while not burning a ton of calories. 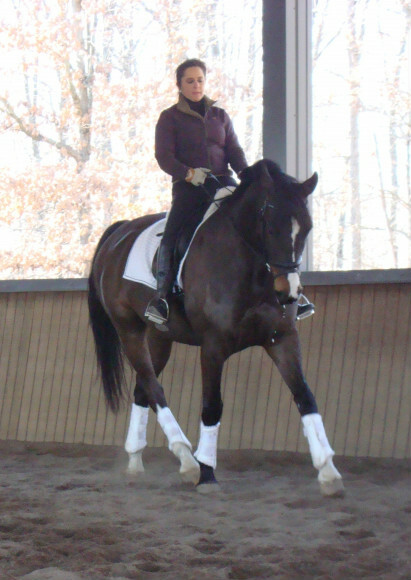 I once did a clinic with Danish trainer Per Meisner where part of my warm up included alternating from collected trot to working trot, sure enough after this exercise my horse was more atentative to my aids. Per also emphasized the key to beneficial transitions is ensuring you engage the hind end even in downward transitions. If you are interested in reading more about transitions then Henk van Bergen, Dutch Trainer & Olympic Coach, has written a lovely detailed article called “Transitions, the Secret to Balanced Riding” available on the Dressage Today website . ← Joy is… discovering a new tack store!